You need a carbon monoxide alarm if you have a wood or gas fireplace, gas furnace, water heater, range or attached garage. Providing protection from propane, natural gas, and carbon monoxide poisoning. You need a carbon monoxide alarm if you have a wood or gas fireplace, gas furnace, water heater, range or attached garage. 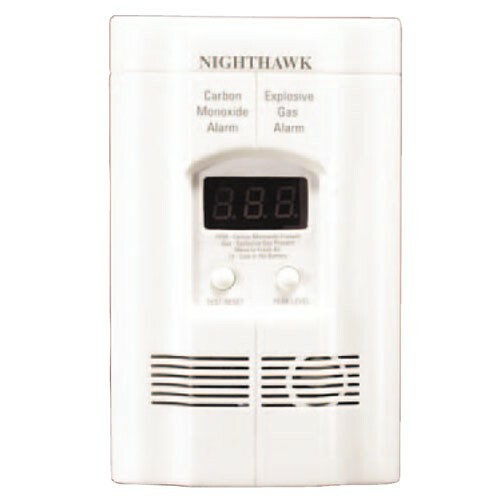 Providing protection from propane, natural gas, and carbon monoxide poisoning. AC Plug-in Operated – Easy to install - Just plug into an AC wall outlet. 9V Battery Backup (included) – Continuous protection in case of power failure. Test / Reset Button – Tests circuitry and resets alarm. Digital Readout – Continuous display of CO levels. Peak Level Memory – Recalls the last highest recorded level of CO.
Three Mounting Options - As a direct plug-in, as a table top unit, or as a wall mounted unit.